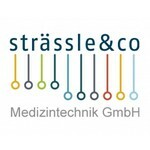 Strässle & co is one of the world's leading manufacturers of ECG vacuum systems. Our machines are used in hospitals and clinics throughout the world to complement ECG and ergometer workstations. Vacuum systems supplied by strässle & co are renowned for their superior range of functions and reliability, for their intuitive ease of use, their well - engineered control technology and their tremendous efficiency. All ECG vacuum systems supplied by strässle & co can be easily attached to virtually all ECG machines and can also be customized to fit whenever necessary. Of course we also supply many sophisticated and practical attachments and modification options for the various ECG trolleys. Finally we come to the most important point. Customers who are familiar with our solutions are no longer prepared to sacrifice comfort and performance. Vacuum systems made by strässle & co optimize pressure transmission quality thanks to the special automatic low - pressure control. This gives the suction cups optimum adhesion to the skin surface - automatically and instantly, saving time for the user and maximizing on-the-job efficiency.